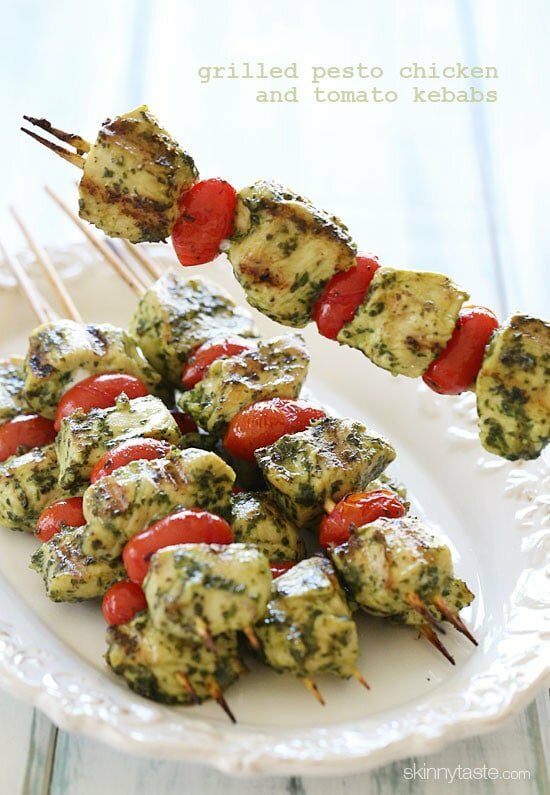 Grilled Pesto Chicken and Tomato Kebabs just SCREAM summer, made with chunks of boneless chicken breasts, skinny basil pesto and grape tomatoes. 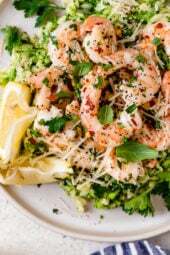 Serve this as an appetizer at your next backyard bash, or have them for dinner any night of the week with a great big salad or over pasta. We grow sooo much basil in my garden all summer long, so I make a lot of pesto and use it so many ways. This is super easy and can be made a day ahead, in fact the longer it marinates the better! Doubling the skewers helps keep everything in place while grilling, and makes them easier to turn. I love how the tomatoes taste after they are grilled, and they smell just divine when they come off the grill. To make my pesto skinny, I use less oil and make it without the pine nuts – but it’s still so flavorful you won’t miss them! 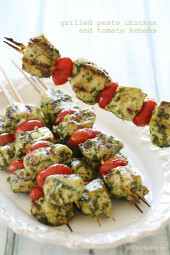 If you’re having this for dinner, I would serve 2 skewers, rather than one with salad or grilled veggies on the side. These are gluten free, inexpensive, low-carb, clean and simple. If you want to make them paleo, you can leave out the parmesan and swap it for pine nuts. If you love pesto as much as we do, you may also love Skinny Chicken Pesto Bake, Grilled Pesto Shrimp Skewers, or this delicious Eggplant Panini with Pesto – so good!! 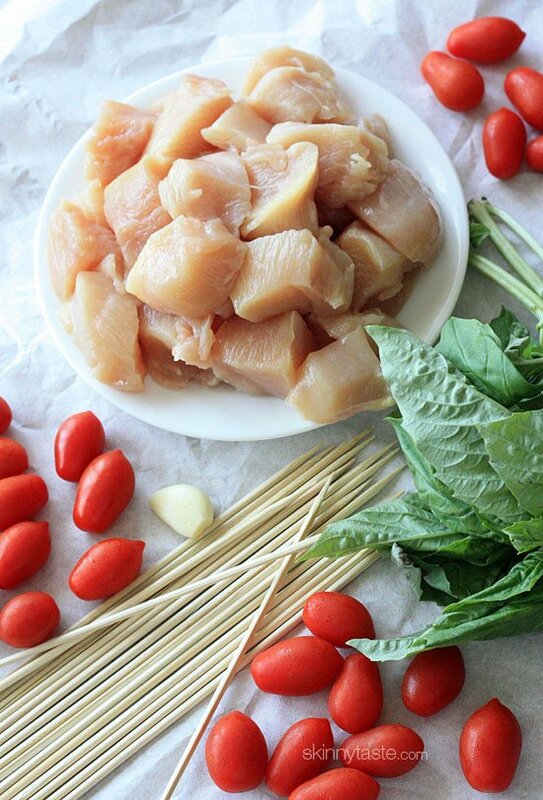 Combine the raw chicken with pesto and marinate a few hours in a bowl. Soak wooden skewers in water at least 30 minutes (or use metal ones to avoid this step). Heat the outdoor grill or indoor grill pan over medium heat until hot. Be sure the grates are clean and spray lightly with oil. Place the chicken on the hot grill and cook about 3-4 minutes; turn and continue cooking until chicken is cooked through, about 2 to 3 minutes. I used the recipe builder on the WW app and it came to 16 points for the whole recipe, or 2 points per skewer. I think possibly the serving size is supposed to be 2 skewers (4 points) instead of 1. Did anyone else see the same thing? Hi Christine! The only accurate way to determine any recipe’s SmartPoints® value is to plug the ingredients into the recipe builder on the Weight Watchers website (Click on “My Foods,” select “Recipe,” and click “Create a recipe.”) which does not count fruits and vegetables in recipes in the calculations as they are now 0 points. Thanks for the reply Gina! I did use the Recipe Builder – I think actually it’s just that the points listed are for two skewers, not one. The only reason I checked is that 4 points for one skewer seemed pretty high to me and I couldn’t figure out where it was coming from – I think the 4 is for two skewers! It’s not a big deal though, I was just curious if anyone else had noticed the same thing. I am endlessly grateful for everything you do, seriously, I feel healthier than ever and you’ve made it SO fun. I just love revisiting your menus! Made these this past weekend to use up some of the basil in my yard .! Delicious! Used the leftovers to make a pita pizza the next day! Will definitely make again! Can you freeze chicken pieces with the marinade for later use? I would love to have this in the freezer for a quick summer meal. Thx! I copy and paste into a word document with the picture then print. I will be making these next weekend. Can I make a suggestion about the Print option. I wish it would print with a small picture. I eat with my eyes… Few weeks later, when I want to make a recipe again, having a picture in my cook book makes me want to cook a recipe more, it’s easier to refresh in my mind what I’m making when I a have a visual 🙂 I love your blog and get many recipes here! Great idea. I pinned it to make this weekend! Would this work with beef also? I have cubed beef that I was going to use for plain ol' boring kebabs with peppers and onions, but this looks amazing! Is there anything I could sub for the cheese? Would love a dairy free option. Is there anyway I can make this with out a food processor? I made this as an appetizer for Christmas dinner and it was a hit. The colors are what drew me in to begin with, but the flavor was phenomenal too! Is this recipe good cold or does the chicken become tough? In my opinion the chicken is fine cold, but the tomatoes are gross cold. I made these skewers for dinner last night. DELICIOUS!! Thank you for posting. Have made these twice. My boyfriend says the are "restaurant quality"! LOVE THEM! I made this last night and can't rave enough about it. So simple, quick, and delicious. Even my picky son who currently hates everything except ham, fish sticks or peanut butter and jelly devoured it! I think he ended up eating more than my husband and I did! Thanks! These will work well on our Banting diet as well (LCHF). Oh my these are delicious. My family couldn't say enough about how good they are. They taste like a big mouthful of summer (which is much appreciated after such a long, cold, snowy winter)! Made these last night. They were a hit. I got asked to give the recipe for the basil pesto mix. Thanks for such a great flavorful recipe! This was amazing! The pesto was brilliant. I used zucchini instead of tomatoes since I'm not a tomato fan, and a grill pan because I don't have a grill. Even with all the improvising, it was insanely delicious. I'd definitely make it again but maybe add another veggie to the skewers to complement the chicken even more – maybe summer squash? oh this is so gorgeous, your pics make me tingle! I love pesto and can't wait to try these!! 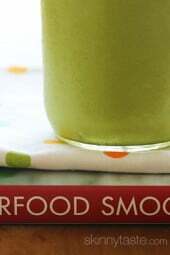 I make a skinny pesto using fresh lemon juice. Would that work as well as a marinade? Can you make them on the stove with a grill pan or skillet if you don't have an outdoor grill? Made these on the grill tonite for a bunch of friends, followed the recipe exactly (with fresh basil from our garden!) and everyone loved them! We'll definitely make them again. Thanks! You always post some of the most delicious recipes ever. I gave this a try today, but put a bit of a twist on it. I actually made cilantro lime pesto and omitted the nuts as well. They were so tasty… Thanks for being such a great inspiration! I also cheated with store-bought pesto; really nice, easy after-work dinner with lovely, fresh flavor. Served it over rice and got the thumbs up from the family. Maybe when I (and my basil plants) are more ambitious we'll try the real thing! I made this last night, but cheated a little…I used store bought Pesto. It was still REALLY good. I actually took the tomatoes and mixed them in with orzo and olive oil for the perfect side dish. I made these for a little get together I had last night and they turned out great!! I actually doubled the recipe so that I would have leftovers for lunches this week, and I don't have any leftovers because people (ahem, my boyfriend) wouldn't stop eating them and raving. Oh, and tonight we are having your chicken enchilada soup. Last week we had your chicken black bean tacos. Notice a trend? I also made these on 6/24! You started a trend, woman! They were DELICIOUS. Just the smell of the marinade made everyone, including four-legged family members, crowd around. Question: my kids are not fans of tomatoes. They don't like the texture at all. What veggie would you recommend substituting for the next time. They gobbled up the chicken (does that sound vaguely wrong?) like dehydrated people on a desert, but picked every tomato off. Any suggestions would be appreciated. This recipe was TO DIE FOR!!! And EASY!! My boys wouldn't have eaten the tomatoes, either. Perhaps chunks of potato would appeal to the kids better? Not sure if they'd cook as quickly as the chicken, though. Perhaps parboil them first? I have made these several times now using a ton of different meats and veggies. Chicken, beef and shrimp all are very tasty with the pesto. I also haven't found a veggie yet that folks haven't liked with it. We have done the tomatoes (which are the least favorite, folks don't like the skins), onion, bell peppers, mushrooms, squash, zucchini, tiny potatoes, even pineapple. 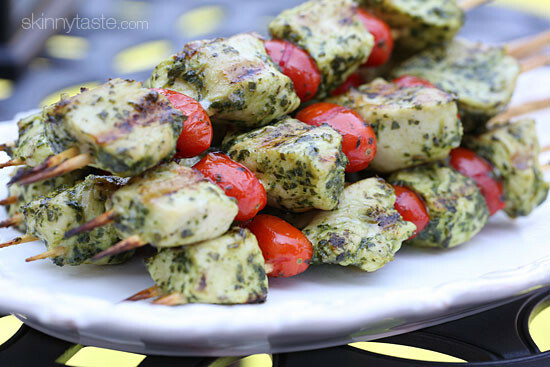 Everything we have tried with this pesto, put on a stick and grilled has been a huge hit. We made a ton to feed a crowd, and had left overs the next day, it reheats well. I made these last night and added onion. My husband said at least 5 times how good they were. He also said it might be the best thing I ever made. We'll be having these again for sure. Thanks for another great meal! WOW – fantastic! I did mine on the George Foreman. Also added only a tablespoon of pinenuts to the pesto. Probably added 1 point per serving. The smell was awesome. Marinated overnight. Might have leftovers in a wrap or on pasta? Super simple recipe. Mmm- these are perfect for summer grilling! These were really good. We really enjoyed them and will make these again. 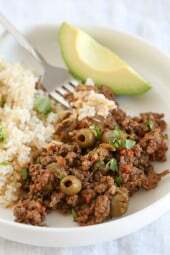 Just tried this recipe and it' so good!!! Everyone loved it! Making these today, they look tasty, about to go put it on to marinate! Anyone tried adding mushrooms to them yet or onions? I look for any excuse to add mushrooms to things, and the husband does the same for onions, and with kebabs we can customize our own. Got both chicken and salmon marinating now; gonna add red bell pepper and purple onion to the kebab. Great diet dinner and easy too! Made these tonight, they were great! They took a lot longer to cook (like 5 minutes more) then you indicated though, but I probably just cut my chicken pieces too big. I also cut up some zucchini and alternated with the tomatoes (I have no garden and grape tomatoes are pricey here) and it was really good. Sorry I hate to be a critic because I love this site . . .I think I could have cut the oil in the pesto by a tbsp and still had lots of flavor . . . thoughts? It seemed like a lot for the amount of basil. That's ok, sure if you can use less oil, go for it, although I find it hard to blend well. So yummy and healthy! I love pesto so much, this is a great summer dinner. 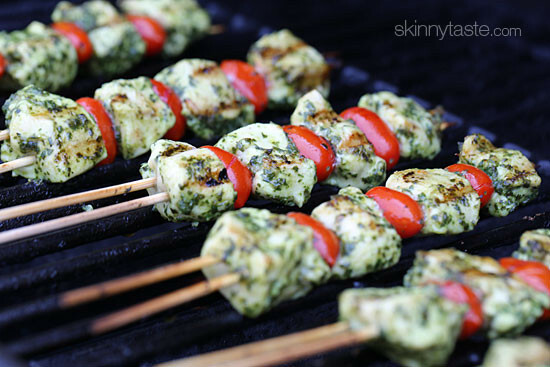 I love grilling kebabs in the summer and this is a perfect idea for them! Great recipe, Gina. Thanks and have a nice weekend! These look delicious! 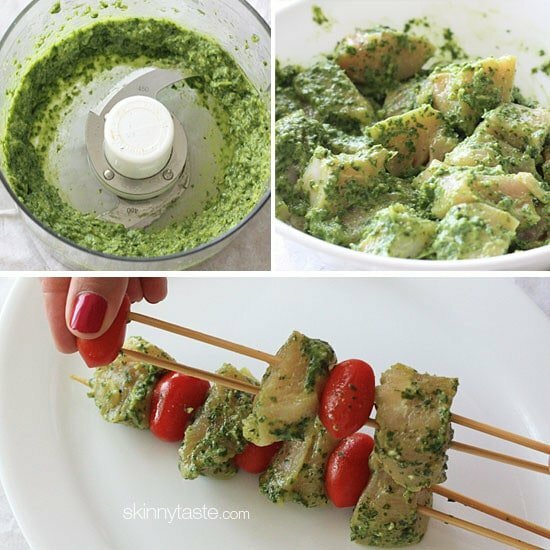 Pesto goes well with so many things and using it in grilled chicken kebabs is such a great idea! Looks so simple and so yummy! Tried this today and loved it! This looks amazing and perfect for summer entertaining! What a perfect summer dish! Love it. 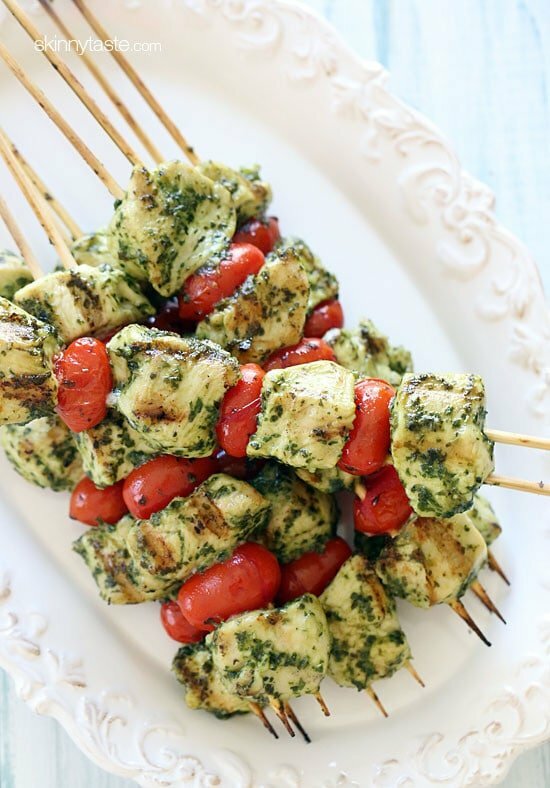 I just made chicken kebobs the other night – these would've been delicious! I rarely put nuts in my pesto and always add a couple extra garlic cloves for a bit of a kick.